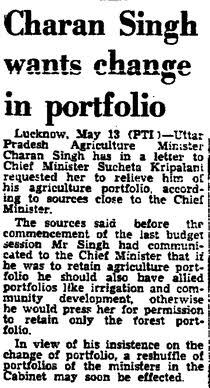 Agriculture portfolio taken away on 14 May. Holds Forests and Local Self-Government from 14 February 1966 till 13 March 1967. Even when holding the unimportant LSG portfolio, he continues to implement his beliefs in administration. And his views on the agitation of the lower grade of government employees for higher wages and Dearness Allowance.